She fell asleep and had a dream.The mother is walking down a long, dark tunnel, struggling to find her way. In the distance she sees a light coming towards her. It is her son who is holding a lamp. She is so happy to see him, she embraces him. He turns to her saying ‘I smile at life’.The light holds them together as he leads her though the passage. he stops, turns to her and says again ‘I smile at life’.He leaves her then, with the lamp, so that it may guide her though the dark. “I smile at life” 93 cms x 1,28 cms. conte, charcoal and acrylic on paper. The sudden death of young Seamus Heaney’s four-year old brother is a fact shared with every Junior Certificate student. Yes, the poet really did lose his brother, Yes, the child was only four years old. But that is not the point. First included in the collection Death of a Naturalist (1966), the poem puts words on a trauma that is unspeakable, by its nature. It turns the work of mourning into a work of art. The 18 works in Annabel Konig’s exhibition were provoked by her experience of loss. On 23 October 2007, her only brother Tim died. He was her childhood playmate, the companion who skimmed stones with her on the seas at Roaring Water Bay and went ahead to navigate the mysteries of growing up. He died too soon, like every love we lose. Annabel’s practice is about life, as well as loss. In Felia, Felium (1977), a three-part video piece, she re-represents images of pregnancy and birth, the better to explore how fragile life and love can be. In Generation (1998.2005), she explored he memory and reminiscence though different media and sources, inviting other people to so-author her artworks and in Kilkenny, freeing hundreds of balloons into the sky as symbols of joy, remembrance and letting go. Here, Konig returns to the roots of visual culture, the physical gesture of making marks by hand. She turns away from her usual collaborate and shared experiences of art making and authorship to work in a solitary, direct manner. She makes her mark using charcoal and pencil, sometimes adding a thin layer of acrylic and, once, of watercolour. 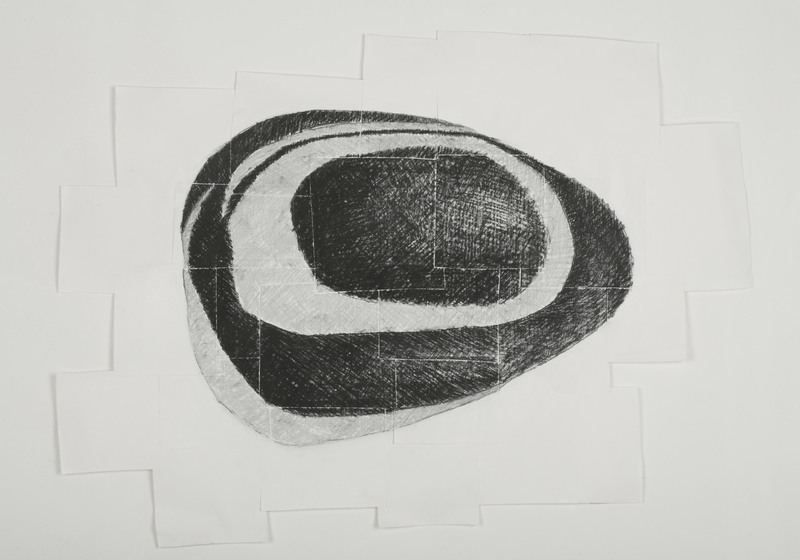 Hers is the intimate relationship between eye and hand, between a human being and a fragment of material – paper, frayed at the edges or layered, plane upon plane. Konig’s return to drawing is an unembellished act. The image on which she works through her grief is a pebble, drawn repeatedly in different perspectives and numbers. You could image a child collecting pebbles such as these, gathering them on a beach or strand and feeling them clattering together in her pocked all the way home, weighing her down. Then perhaps, painting them, arranging them by size or shape, examining them from time to time and finding a favourite who looks or touch makes them beloved. An image, the pebble is ovoid in shape, sometimes more, sometimes less. As icon, the pebble has a history from pre-history, older than humanity. It’s permanence offers a reassuring narrative about how some things last, as long as there are people to name and remember them. It is a bit of the natural world used to make a cairn, or burial mound, as well as the counter in a readymade abacus or game of chess. Sometimes it is a weapon, used to hurt. The pebbles, or stones, pictured in this series come in all shapes and sizes. Their scale is inflated, often enlarged way beyond the actual objects. In this sense, Konig’s drawing don’t pretend to mimic nature. They don’t try to seduce the viewer with dazzling displays of light and shade, colour and depth, or realism. They function as flat, diagrammaitic objects that set up a time and space of their own. They distance the artist from what they appear to represent. So they aren’t life drawings. 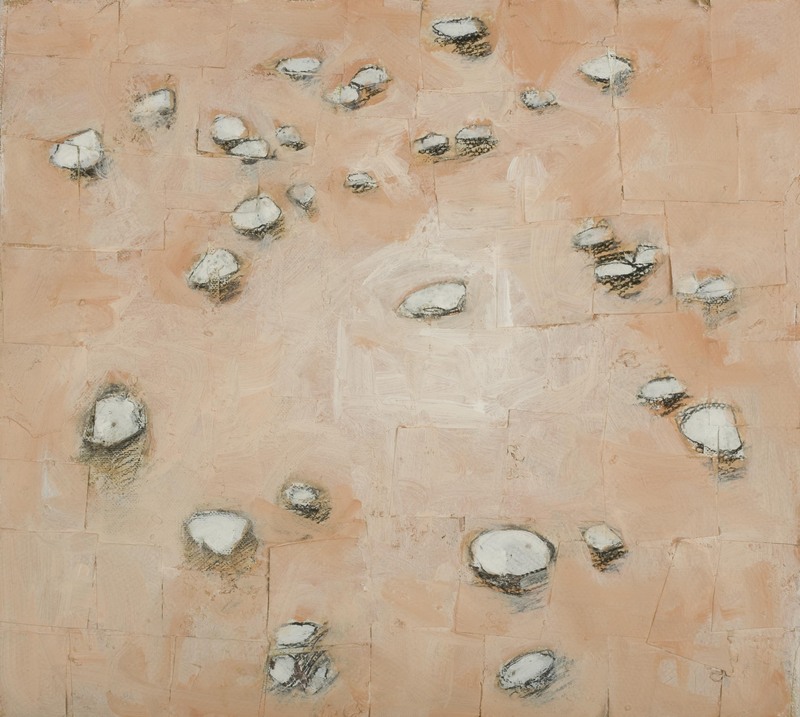 Instead, the pebble/stone form works as a mass on which she projects her investigations. Konig scrutinises each surface, exploring weight, volume, density, or not. A form can emerge as a black hole. 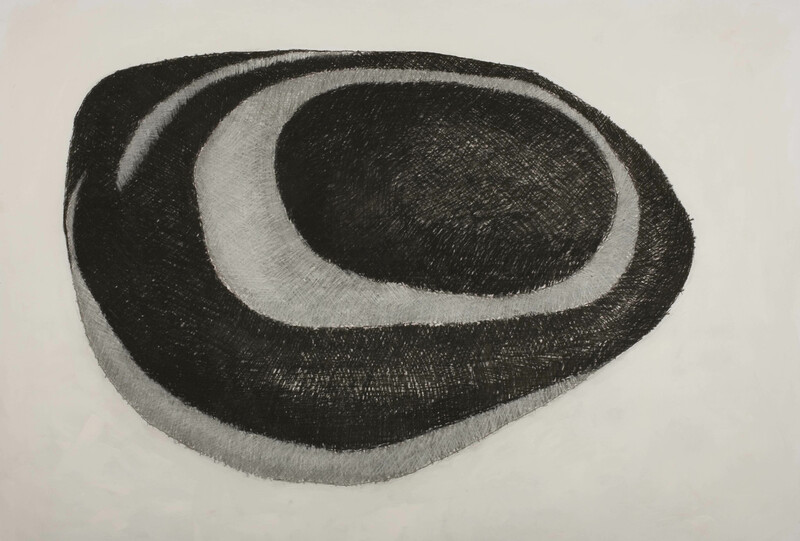 it’s surface teased out of nothingness by taut charcoal marks and made visible. Sometimes it is etched or inscribed by Ogham-type writings, as Konig draws more out of the void. John Berger writes of drawing as “…a two-way process. To draw is not only to measure and put down, it is also to receive. When the intensity of looking reaches a certain degree, one becomes aware of an equally intense energy coming towards one, thought the appearance of whatever it is one is scrutinising”. “It is a feriousious and inarticuled dialogue”, he continues. “To sustain it requires faith. It is like a burrowing in the dark, a burrowing under the apparent…Sometimes when the dialogue is swift, almous instantaneous, it is like something thrown and caught”. Experiencing grief is universal yet each of us is stamped by grief in a singular way. Rituals of loss and mourning reach back thousands of years and gift the present with great art and craft, from funerary urns and Chinese terracotta warriors to keep traditions and epic surveys such as Picasso’s Guernica. Konig’s singularity must stay outside the frames seen here. 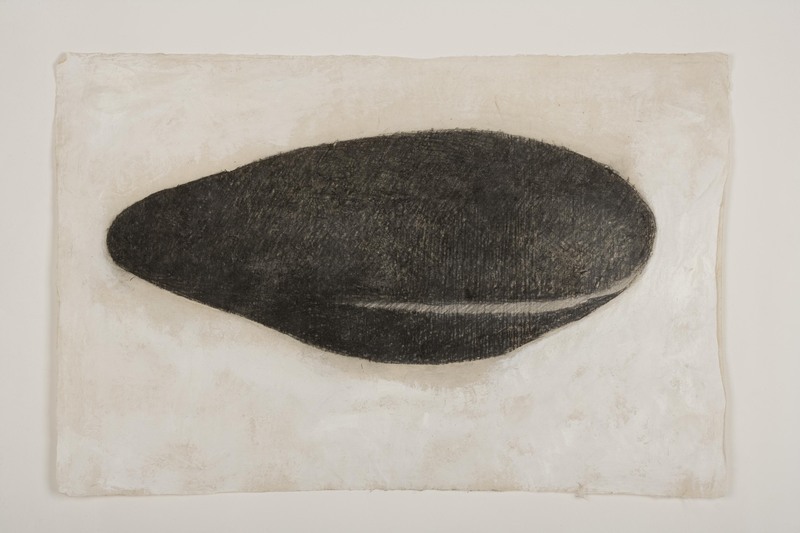 What counts is her choice of drawing as medium, used in a precise delineated way until you get up close and see how intensely she marks her images, how repeatedly her hand claims more and more of the work. This making art out of empty space sets up a conversation between absence and presence, love and lack, appearance and disappearance, real and imaginary. The hard work of mourning is embodied in each drawing and re-represented symbolically by her hand. It is important to distinguish this symbolic work from the work of therapy, just as it was important to say that the real-time death of young Seamus Heaney’s brother was not the point. Here, a personal process is made public, but not as a direct representation. Loss is transformed into art. “I have come to catch your voice” 29.5 cms x 47 cms. pencil, charcoal, paper and acrylic on canvas. “Sigh” 50 cms x 74 cms. charcoal, conte, pastel and acrylic on paper. “Small Talk” 62 cms x 87 cms. pencil, charcoal, conte and pastel on paper. Winner of Category A, Europol Open, The Hague, the Netherlands.